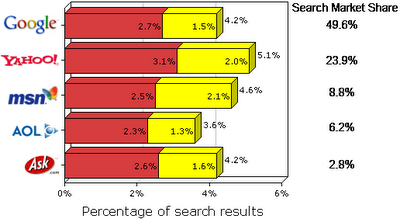 1 in 20 Search Results Are Dangerous: Is Your Search Engine Safe? You probably implicitly trust the search results you get from Google or Yahoo, trusting that they wouldn't unwittingly (or even deliberately) put dangerous sites at the top of the results list. However, a study done by computer security firm McAfee indicates that about 5% of search results of the five major search engines (Google, Yahoo, AOL, MSN, and Ask) are dangerous. Yahoo is the biggest culprit, coming in with 5.1% of search results rated red or yellow, with AOL safest at 3.6% of results. "Red" meaning sites that distribute adware, for instance, and "yellow" referring to sites with many pop-up ads. Surprisingly, unsafe search results are actually more common in sponsored results, which you'll notice Yahoo places before organic, or unsponsored, search results. This increases the likelihood that you'll click on an unsafe link. Such ads are three times more likely to be fraudulent than regular search results. By contrast, Google places sponsored results to the right of organic search results. Google's sponsored results are also more likely to be safe than Yahoo's. Adult searches, which are twice as dangerous as non-adult searches. Keywords like "bearshare", "free ringtones", and "free screensavers", which were the most dangerous of all. Ads with the word "free" in them tend to be untrustworthy. Searches within categories like Tech Toys and Popular Software are more dangerous. Be skeptical about claims in sponsored results that you see, especially when they offer something free. Don't give out your primary email address. There are plenty of disposable email services out there. After you download files from the Internet (like Bearshare or Kazaa), make sure to run them through a virus scanner before installing or running them. You might want to consider using McAfee's SiteAdvisor extension for Firefox or Internet Explorer. It'll tell you how safe McAfee thinks each search result is. Scan your computer regularly for adware and spyware. What If Corporate America Went 2.0?